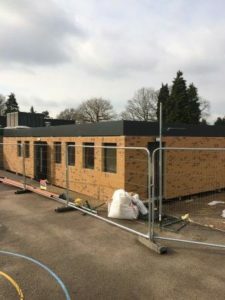 Progress on the new building continues apace. 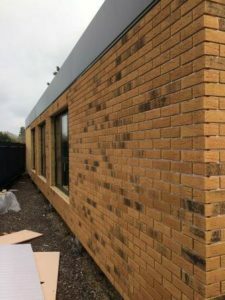 Over half term, the walls were insulated and lined, then the brick slip was added to give a better external aesthetic. We are still a good 2 weeks away from completion, but the suspended ceiling has been installed and internal electrical works are now underway. 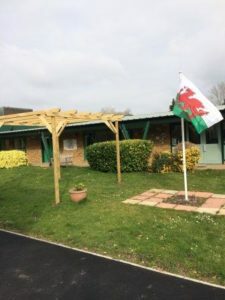 To mark the patron saint day of each nation in the United Kingdom, we traditionally fly national flags on relevant date. It was with some regret, however, that after last Saturday’s rugby result I had to hoist the Welsh dragon in our central courtyard to honour St David’s Day on 1st March. Still, “Iechyd da!” to all proud Welsh men and women. 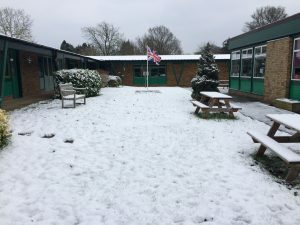 Looking back to this time last year, though, the school courtyard had a very different look as the so-called Beast from the East was ravaging the country.